Can anyone using Android KitKat 4.4 in their device? Google has been rolled out new operating system Android KitKat 4,4 with Google Nexus 5 and it is compatible with other Android Smartphone and table devices such as Nexus 4, Nexus 7, Nexus 10, HTC One, Google Play Edition, Samsung Galaxy S4 Google Play Edition and so on. 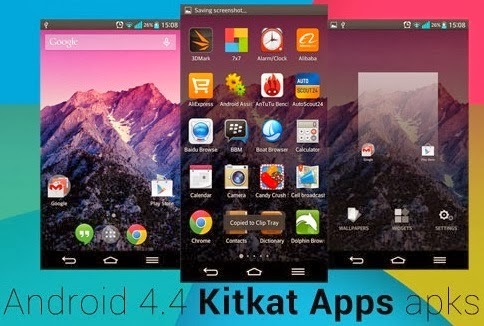 If anyone don’t know about KitKat 4.4 and not using an Android Kitkat 4.4 device but now you can use and download your favorite apps, games and other features of Android Kikat through Direct Download links of Android 4.4 KitKat. Below you can check wallpapers and stock apps for other Smartphone’s and tables. Now anyone can install Android KitKat 4.4 pre installed stock apps, games and devices wallpapers. How? You guys just need to install package for non-Android 4.4 OEM devices such as Samsung’s Galaxy S4, LG G2, Xperia Z1, and Moto X so on. Which program you can through download package for non-Android like New Google Experience home launcher, Email app, Clock app, Google Calendar app, Hangouts v2.0 app, Camera & Gallery app and Keyboard app with emojis and etc. If you are wondering that how you guys can download these program. Don’t worry all files are available in .APK format in a .ZIP file but remember that all .APK files doesn't work on few version of Android. If you already it then you might face some crashes and bugs program while using applications or game on your Android Smartphone’s. Why you guys facing this kind of crashes? This is not officially supported for other Android device that’s why you face this. Being an Android user why you are waiting for just grab your download link and then install Android KitKat on your android Smartphone’s along with amazing applications, games via .APK files and you want Wallpapers package for other Android Smartphone’s and Tablets then download manually.